The Wilmington & Western Railroad's 10-miles of track wind through some of the prettiest scenery in the tri-state area. Just a few miles west of I-95 is a tranquil and historic area that is best seen from the comfort of a train. 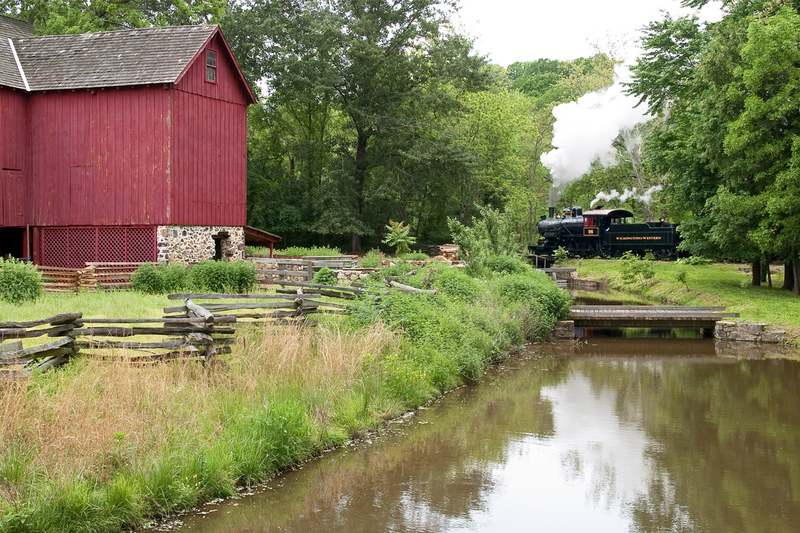 Upon leaving Greenbank Station, our train crosses the Red Clay Creek for the first time and passes Greenbank Mills & Philips Farm, the only surviving mill along our route. There were dozens of mills along our tracks in the late 1800s, and the Wilmington & Western was built to move goods between the mills and the Port of Wilmington. In 1852, the son of one of the mill's owners built a mansion overlooking the mill. He named the mansion "Greenbank," and the name of the mansion eventually became the name of the community. Shortly after passing the mill, the train rolls through Brandywine Springs Park, the site of an amusement park in the late 1800s and early 1900s. Brandywine Springs once featured a fun house, pony rides, dance hall, lake, bandstand and various other amusements, and many people came to the park on the Wilmington & Western. The amusements closed forever in 1923 and today, Brandywine Springs is a New Castle County Park - only the stone foundations remain of the park's amusements. The Friends of Brandywine Springs perform monthly archaeological digs in the park to uncover the history of what was once a popular summer destination for local residents. Engine 98 passes Greenbank Mill. After crossing the creek again, our train enters the community of Faulkland. An inventer named Oliver Evans built a grist mill here, and Evans revolutionized the milling industry by inventing a series of machines to reduce the amount of labor needed in the physically demanding milling process. In Faulkland, our tracks run through the back yards of many homes in the Brookmeade II and Brookmeade III housing developments, and the residents will often come out to wave to the train as we roll by. After passing Brookmeade, we come alongside the old Hercules Research Center. After the government ended the DuPont Company's gunpowder monopoly, the Hercules Company was formed to continue gunpowder production. Hercules used this facility for research and development, but the property was sold in 2008 to other interests. Our train crosses Lancaster Pike (Delaware Route 48) and enters Wooddale, another small community which once had a post office, church, school, general store, hotel and a train station. The town was named after Alan Wood, the owner of the large Delaware Rolling Mills complex which once stood here. The mills are notable for having produced all of the shovels used in digging the Chesapeake and Delaware Canal. Wooddale has three of the most scenic features of the railroad. First, the train passes through the Wooddale Rock Cut (a tunnel without a roof), where rock walls come within five feet of the train on each side! Next, we pass the Wooddale Covered Bridge, one of three such bridges in the state. The bridge allows Wooddale residents to cross the Red Clay Creek to get to their homes. Finally, our train passes the old Wooddale Quarry. The 175-foot quarry wall is visible from the train. There are large homes built into the quarry floor and throughout this area. The caboose is seen passing through Barley Mill. Just beyond Wooddale, the wooded forests give way to open fields at Barley Mill. For most of the trip, our train twists and turns as it follows the Red Clay Creek, but here, our train runs along the straightest section of track on the railroad for a distance of a half-mile. After crossing Mt. Cuba Road, our train enters the community of Mt. Cuba, which is home to the Mt. Cuba Observatory and the Mt. Cuba Center, a 650-acre wooded oasis dedicated to the conservation of plants native to the Appalachian Piedmont. Although the observatory is not visible from the train, much of the land on either side of the tracks here is owned by the Mt. Cuba Center. We cross the Red Clay Creek again and enter the Mt. Cuba Picnic Grove. The grove is located on the banks of the Red Clay, and on all Mt. Cuba Meteor excursions, you can de-train here for a half-hour to stretch your legs, have a picnic lunch or admire the natural surroundings. For those who don't want to layover at the grove, you can stay on board and the train will continue another few miles to Ashland and Yorklyn. After leaving the picnic grove and crossing the Red Clay Creek again, our train rolls through the Mt. Cuba Rock Cut, which is smaller than the cut at Wooddale. All of the rock had to be removed by hand to make way for the railroad using picks, axes, shovels and black powder. It cost so much money to blast through the rock to build the original Wilmington & Western that the original owners were forced to declare bankruptcy after just three years in operation. Upon entering the small town of Ashland, our train crosses Bridge 11A, the Ashland truss bridge, which is unique in that it can be seen from the coach windows, and it is the only iron bridge on the railroad (all other bridges are built with steel or wood). Ashland is the home of the Ashland Nature Center, and the train skirts the northern end of the property. The nature center is nestled among 600 acres of forests, fields, meadows and streams. The Easter Bunny Express and the Santa Claus Express both pause here, before returning to Greenbank. Engine 98 rolls along at the Sharpless Dam. Our train crosses Sharpless Road, and passes the Sharpless Dam, whose waterfall is another scenic highlight in this area. We then run alongside Creek Road (Delaware Route 82) for a quarter-mile. Drivers and cyclists often slow down along this stretch of our line to wave to our passengers and take pictures of the passing train. There were two major industries in Yorklyn at the turn of the last century - snuff milling and paper milling. In fact, the world's largest snuff mill was located here in Yorklyn, and was served by the Wilmington & Western. Snuff is a form of smokeless tobacco which was popular in Europe during the 18th and 19th centuries. Some of the old mill buildings still stand in the area. Two important pieces of Yorklyn (and railroad) history have been preserved and are on display at Greenbank Station. First, the old Yorklyn station now serves as the Red Clay Valley Visitor Center & Museum, and is typical of the other stations that were located along the line. Second, a cart used for hauling snuff around the Yorklyn snuff mills is also on display at Greenbank. The modern Wilmington & Western was born here in Yorklyn. We took delivery of our first steam locomotive and our fleet of passenger coaches here, and that locomotive was restored to operation in one of the old mill buildings. Since leaving Greenbank, our tracks have been closely following the Red Clay Creek, but in Yorklyn, our tracks and the creek diverge. Our tracks curve sharply to the west and head up the 1.75% grade into Hockessin, which is known on the railroad as Hockessin Hill. At the bottom of the hill, the train rolls through the now-abandoned National Vulcanized Fibre Company (NVF) property. NVF once made a number of fiber-based products, including electrical insulators and wood veneers. The property was sold in November 2009 to the State of Delaware for conversion into 87-acres of mixed-use retail, restaurants and housing, as well as walking trails and parkland. Now known as "Yorklyn Village," you can follow the progress of the redevelopment at Yorklyn.org. 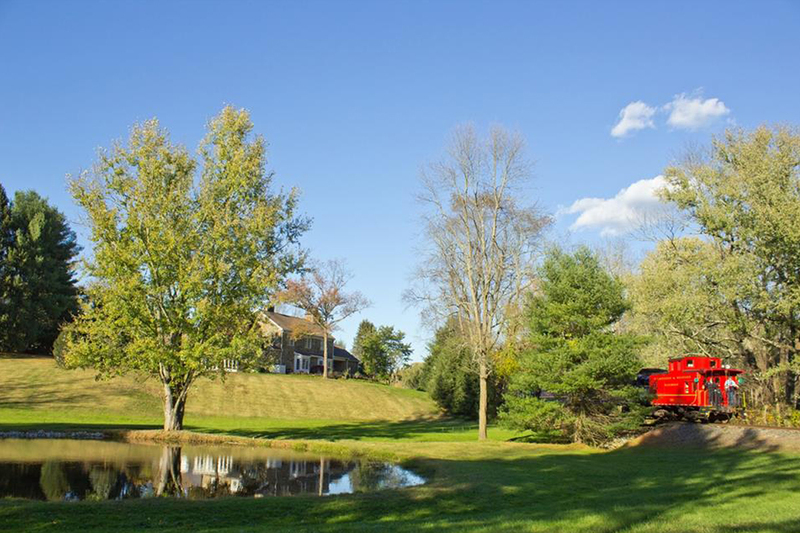 The first European settlers arrived in what is now Hockessin in the late 1680s, and William Penn later gave much of this land to his daughter as part of a 15,000-acre estate. An early fall excursion travels through NVF. In 1820, kaolin clay was discovered around Hockessin. Kaolin is an extremely high-grade of white clay which was highly valued for its use in fine china. As our train enters Hockessin, we pass one of the abandoned open pit mines from which the kaolin was dug, and the railroad was the primary vehicle by which the kaolin traveled to port. The coming of the railroad transformed Hockessin from a small farming community into the residential and agricultural center it is today. 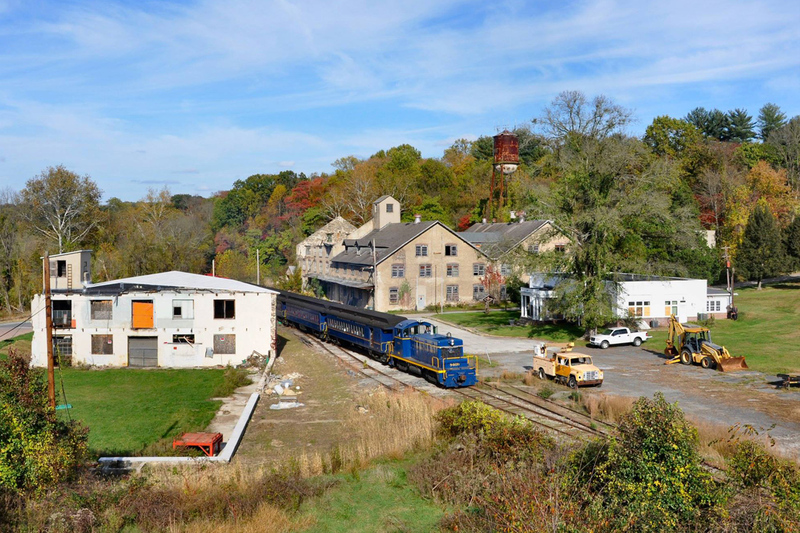 Although the original Wilmington & Western went as far as Landenberg, PA, the tracks were cut back to Hockessin in the 1950s due to a decline in freight traffic west of here. Upon arrival in Hockessin, passengers can de-train and browse the local shops and eateries in the downtown area during the 30-minute layover. 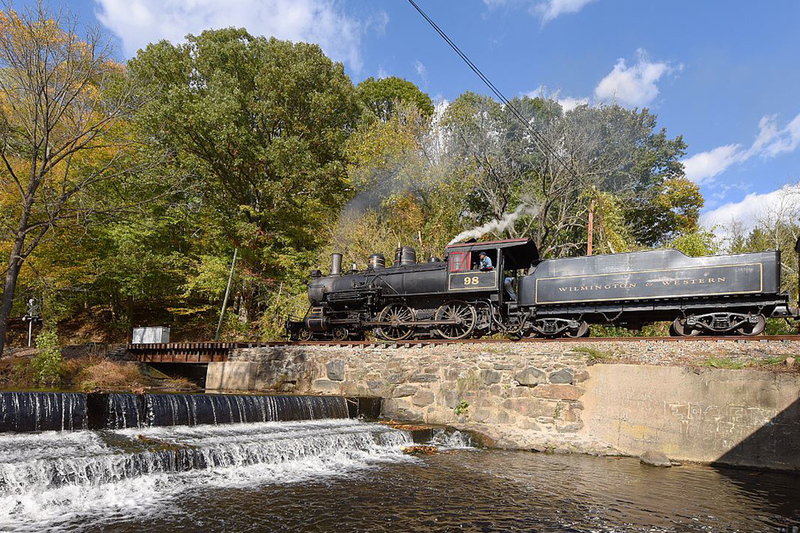 Among the excursions that travel to Hockessin are the Fireworks Express, Hockessin Flyer and the 2½-hour Autumn Leaf Special. One weekend each year, you can board a train in Hockessin and travel east through the valley to Mt. Cuba. The Wilmington & Western sponsors an art festival each February at Hockessin Memorial Hall as a fundraiser for the railroad, and 30% of all art sales goes directly to support our operations and restoration projects. 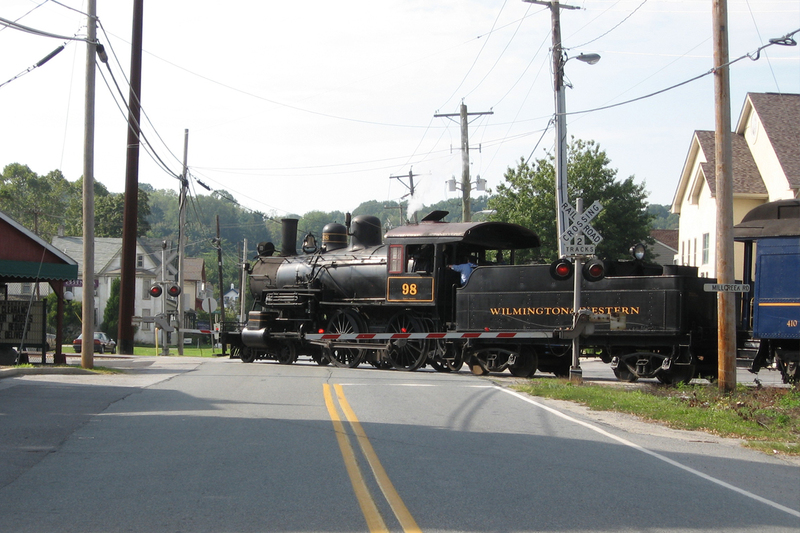 No matter which train you ride or how far you travel, a trip on the Wilmington & Western through the Red Clay Valley will open your eyes to an area rich in history, scenery and trains! Engine 98 arrives in downtown Hockessin.